Monro needed the promised men badly. When Webb left on July 29, Fort William Henry’s garrison consisted of only about eleven hundred soldiers fit for duty, together with sixty carpenters and sailors, about eighty women and children, and a handful of sutlers. Since its total complement of vessels on the lake now consisted of five whaleboats and two armed sloops (one in need of repair), Monro knew that he could not prevent the French from investing the place with artillery. The larger the number of men in place at the fort on the day the siege began, therefore, the better the chances would be that they could resist the attackers. And yet Webb, fearful of stripping the defenses of his own post, Fort Edward, persuaded himself to dispatch only about two hundred regulars of the Royal American (60th) Regiment and eight hundred Massachusetts provincials under Lieutenant Colonel Joseph Frye. They arrived on the evening of August 2—the same night that lookouts spotted three large fires on the western shore of the lake at about seven miles’ distance. Two scouting boats were dispatched to investigate. Neither returned. At dawn the next morning, observers on the ramparts of William Henry could begin to make out shapes on the dark surface of the lake: there, beyond cannon range, bobbed nearly 250 French bateaux and at least 150 Indian war canoes. To officers surveying the scene through field telescopes, the growing light revealed that more than sixty of the bateaux had been joined together catamaran-style by platforms of planks; these rode low in the water, borne down by the weight of the siege guns they carried. “We know that they have Cannon,” Monro wrote to Webb, in one of three pleas for help he sent that day. 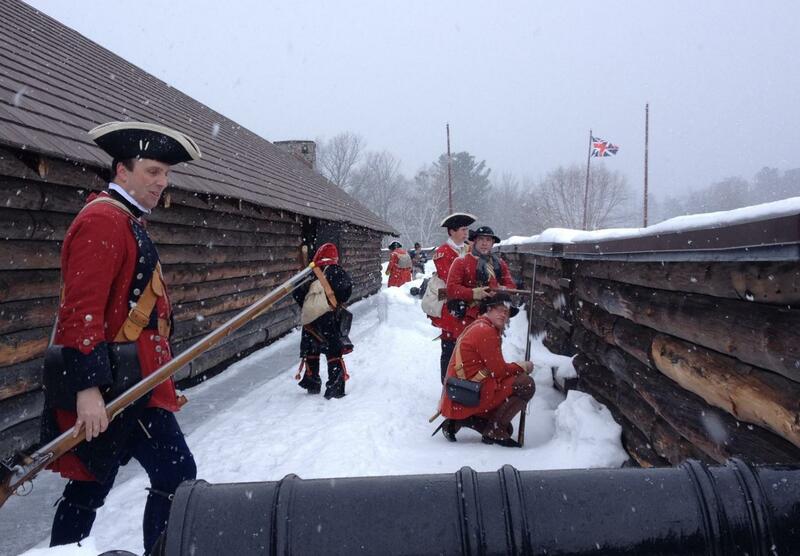 If anyone had entertained any lingering doubts, it was now unmistakable that the second siege of Fort William Henry would be conducted in the European style. Lévis’s advance party fired the first shots at the fort’s defenders on August 3. Even before the main body had landed its artillery and supplies, Montcalm ordered Lévis to circle through the woods behind the fort and cut the road leading southward to Fort Edward. This task his Indians and Canadians quickly accomplished, driving a guard of Massachusetts provincials back to their camp on Titcomb’s Mount and seizing virtually all of their livestock—about 50 horses and 150 oxen, most of which the Indians slaughtered to supplement the scanty rations they had been receiving from the army. Meanwhile, as Indian sharpshooters began sniping at the defenders of William Henry from the main garrison garden—a seven-acre plot lying just fifty or sixty yards from the western wall of the fort—Montcalm brought the main body up from the landing place and surveyed the shoreline for a position from which to begin his entrenchments. 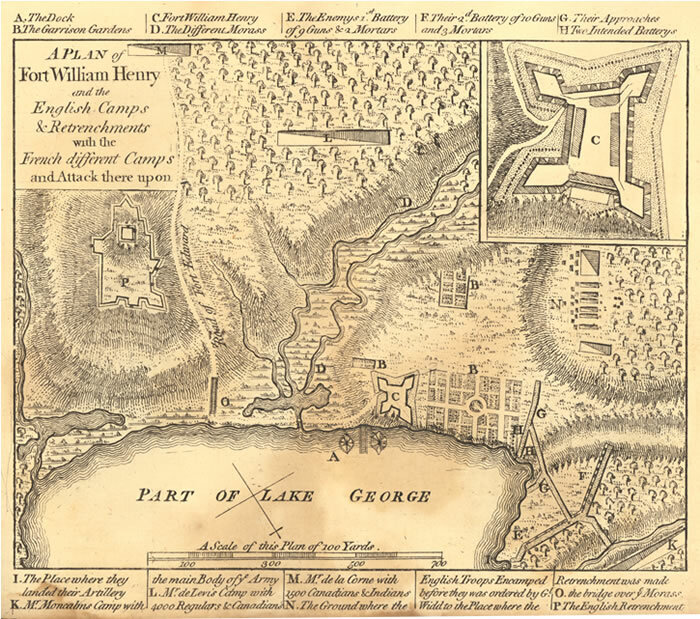 Although Fort William Henry was clearly in trouble on August 3, its position was far from desperate. The fort’s magazines held adequate if not ample stocks of ammunition and provisions; its batteries mounted eighteen heavy cannon (including a pair of thirty-two–pounders), thirteen light swivels capable of raking the wall faces and glacis with grapeshot, two mortars, and a howitzer. A stout stone-and-log breastwork enclosed the provincial camp atop Titcomb’s Mount, which had six brass fieldpieces and four swivels, as well as the small arms of its men, to defend it. The most immediate threat to the fort’s garrison was fire, and Monro soon minimized that danger by ordering the flammable roof shingles removed from the interior buildings and having all stocks of firewood dumped into the lake. The greater dangers were those of the longer term: that a portion of the fort’s wall would collapse under sustained cannonading, allowing attackers to rush through the breach and overwhelm the defenders, or (if the walls held up) that the garrison would be starved into submission. Since time inevitably favored the besiegers, such eventualities could be prevented only if Webb dispatched a relief expedition to attack Montcalm before he had a chance to organize his own camp’s defenses. Hence the urgency of Monro’s three attempts to notify Webb that Montcalm was about to besiege (or, as he said, using the technical term, “invest”) the fort; for without reinforcement from below, Fort William Henry would be no more immune to prolonged cannon siege than Oswego or St. Philip’s Castle had been. Thus on August 4, as Montcalm’s engineers laid out the first line of entrenchments less than half a mile from William Henry’s north bastion and as his Canadian militiamen began to construct artillery emplacements opposite the fort’s western wall, Monro knew better than anyone that—barring a great mistake on his adversary’s part, the arrival of a relief column from Fort Edward, or a miracle—his garrison’s days were numbered. Yet Webb, as Monro would not know until August 7, responded to Fort William Henry’s predicament by deciding not to send reinforcements until he himself had been reinforced by militia from New England and New York. As Webb saw it, to weaken Fort Edward’s garrison would expose Albany and the rest of upper New York to invasion. If Montcalm succeeded in seizing William Henry, after all, he would have not only a fort from which to launch further operations, but a splendid road to use in transporting siege guns against Fort Edward. In a letter of noon, August 4, Webb’s aide-de-camp therefore advised Monro that the general “does not think it prudent (as you know his strength at this place) to attempt a Junction or to assist you” at present. Indeed, in view of the eleven-thousand-man strength of the French force that Monro had reported, and the possibility that Webb “should be so unfortunate from the delay of the Militia not to have it in his power to give you timely Assistance,” Monro might well consider how (if worse came to worst) he “might make the best Terms” of capitulation possible. Monro would receive this message only on August 7 because one of Montcalm’s Caughnawaga scouts stalked the courier into the woods after he left Fort Edward and killed him, long before he could reach Fort William Henry. The bloodstained letter, cut from the lining of the dead man’s jacket, came to Monro under a flag of truce together with a polite note from Montcalm suggesting that he take Webb’s advice and surrender. Colonel Monro declined Montcalm’s invitation on the seventh but knew how far his situation had deteriorated from the relative security of the third. In the intervening days, the chevalier de Lévis had posted his force opposite Titcomb’s Mount, and his Canadian and Indian scouts had made it all but impossible for the provincials to leave the entrenched camp. Indian war parties operating in the woods had cut all communication with Fort Edward. Despite harassing fire from Fort William Henry’s artillery, Montcalm’s sappers had quickly completed the first siege parallel and emplaced a battery from which his gunners had opened fire on August 6. On the morning of the seventh the French had brought a second battery into action and had driven an approach trench to within three hundred yards of the fort’s western wall. From this point, Monro knew, they would dig another parallel trench along which they would site one or more “breaching batteries”; and these guns, firing at point-blank range, would blast passageways through the wall. When Monro received Montcalm’s message on the morning of August 7, Fort William Henry’s walls and bastions were still intact, which according to the elaborate etiquette of siege warfare meant that Monro could not—yet—honorably contemplate capitulation. But he also could not ignore the effect of the indirect, or high-trajectory, fire of the French mortars and howitzers, which had been raining shrapnel on his men and those in the entrenched camp for two days. Monro had been disturbed to learn that some of the solid shot recovered within the fort bore royal ordnance markings: proof that they, like the guns firing them, had been captured at the Monongahela or Oswego. Meanwhile the guns of his own batteries had been bursting at a fearful rate. Since the first shots had been fired at the French on August 4, more than half of William Henry’s heavy cannon had split from prolonged firing, often injuring their crews as they exploded. By sunset on August 8, the relentless French bombardment had shattered the morale of Monro’s garrison, most of whom had not slept for five nights running. Already on the seventh Monro had felt compelled to threaten to hang cowards, or indeed anyone who advocated surrender, over the walls of the fort; now his men seemed “almost Stupified” with stress and fatigue, and there was no telling how they would react to an assault if the western wall, weak from sustained shelling, were to collapse. Knowing now that Webb would send no reinforcements, Monro ordered one of his engineers to survey the damage and report the state of the fort’s defenses. What he heard was that the top three feet of the bastions most exposed to French fire had been shot entirely away; that the casements, or bunkers within them, had been heavily damaged; that all but five of the fort’s cannon were inoperable; and that stocks of ammunition had dwindled to near exhaustion. Nor were the reports he received from the entrenched camp any more encouraging. The Massachusetts troops stationed there had suffered even heavier losses from indirect fire than the fort. As their commander, Colonel Frye, reported, they “were quite worn out, & wou’d stay no longer, And [say] that they wou’d rather be knock’d in the Head by the Enemy, than stay to Perish behind the Breastworks. ”That same night the French completed a breaching battery of eighteen-pound guns within three hundred yards of the fort’s west wall. With so much discouraging information in hand, Monro summoned a council of war from among his officers for the next morning. They unanimously advised him to send a flag of truce to Montcalm and negotiate a surrender on the best terms possible terms.